This Morton 14 oz. extra coarse sea salt grinder refill is designed for use with your existing salt grinder. The larger size of the salt crystals makes refilling easy to reduce mess. Freshly ground sea salt crystals offer bold flavor and a crunchy bite that your customers will love. Use this salt for finishing vegetables, potatoes, meats, or even decadent salted caramel-flavored desserts. It adds an extra pinch of salty flavor to anything you make! Morton Salt is an iconic brand that has become a staple in American kitchens. Sea salt is essential for cooking and garnishing meals, and you'll find plenty of uses for this extra coarse sea salt in your restaurant, concession stand, or catering service. The history of Morton Salt dates way back to the Gold Rush, and this timeless brand has been pleasing chefs and customers ever since, whether it's being used to season entrees, appetizers, or snacks. When searching for coarse salt to refill our grinder we had a difficult time finding a product that was exactly what we were looking for. This product was perfect for us! The right size, the right product, and certainly the right price! 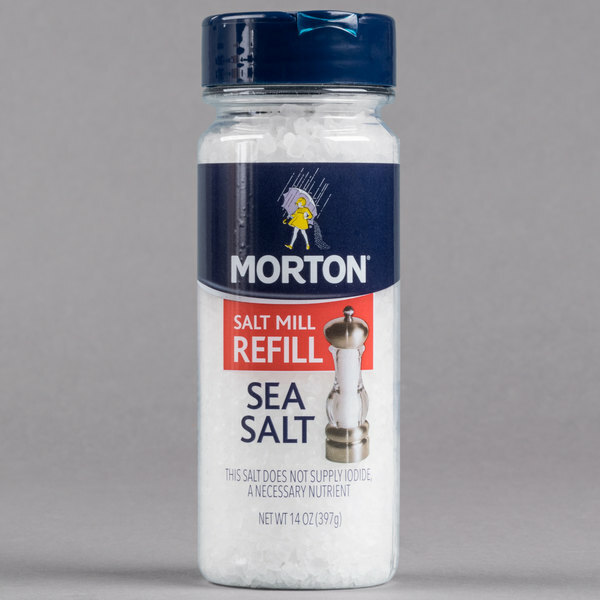 I purchased the Morton sea salt to soak my hands. It works well though it didn't cure my skin, it definitely helped. This was a really good deal and I would definitely recommend. 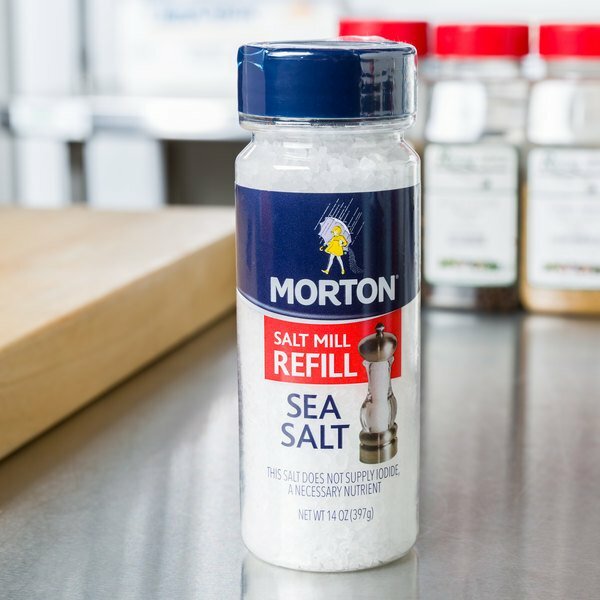 I had used this fourteen ounce Morton Extra Coarse Seat Salt Grinder Refill in the past and I continue to be satisfied with how easy it is to use. The taste is exactly as expected and the consistency is the perfect addition to any recipe. I like how easy refill is to add to rapid reorder and would recommend. I am yet to find a place with a cheaper price for sea salt than this site. Add that to the fact that it's Mortons and the deal is as solid as can be. This is a really high quality product for any kind of salt grinder! Packaging is really good and texture of this product just perfect for grinders! This Morton grinder works well and easily grinds the salt. The salt has a good taste and adds that extra seasoning to bring the flavors out in your dish. This salt is extremely inexpensive. Although it is not the best tasting salt we have used it is good for buying in large quantities and when cooking large quantities of food. We would not suggest using it as a finishing salt but it is great for large catering gigs. Great salt and great brand. I purchased this to use residential in my salt mill.Overall, I have no complaints, and I will most likely be ordering again.